When the title of a poetry book feels like a poem in itself, you know you are in for an enriching read. 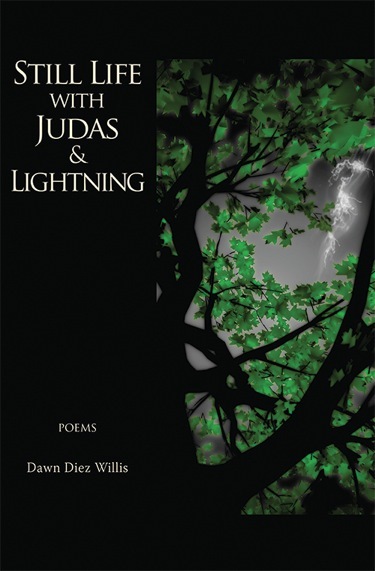 Still Life with Judas and Lightning, Dawn Diez Willis’s first full-length collection, fulfills that expectation, with poems that artfully explore big themes, including faith, loss, betrayal, death, and love. Nearly all the poems in the collection are free-verse narratives in third-person – a point of view that might feel detached in another poet’s hands, but which Willis brings to life with intimacy. I use the label “narrative” loosely, as the stories are not tidy arcs with clear resolution. Yet many of the poems could easily blossom into short stories or even novels. The characters she introduces, whether pulled from Biblical stories, history, art, personal experience or her imagination, feel achingly real and hook the reader into caring about them. They want their own mother. knuckles unsheathed and time punched dumb. drowsing in the white load of rock. His tongue lies burning in his mouth. What can words do now? A cadre of outlaws weaves through the collection as well. Several iconic figures from the Wild West, including Jesse James, Bonnie and Clyde, and Billy the Kid make appearances. And again Willis takes a “behind the scenes” view, illuminating the contrast between romanticized personas and the haunted, broken lives they most likely led. I’ve focused more on subjects and themes here than on craft, but as you can glimpse from the excerpts above, Willis masterfully employs sound, rhythm, slant rhymes, dazzling language, and vivid imagery throughout the collection. Still Life with Judas and Lightning does exactly that – spilling light on moments both holy and ordinary, calling the reader to witness and to question the details of their own story. And I, for one, was grateful for that opportunity. Kelly Eastlund is a member of OPA, Lane Literary Guild, and the Red Sofa Poets critique group. Her poems have appeared in several journals, including Shot Glass Journal, Wild Goose Poetry Review, and The Whistling Fire. She lives in Springfield, Oregon, with her husband and two dogs.